Have questions about skydiving? Our team of expert skydiving instructors have been skydiving North Carolina for years, so we’re well placed to answer your skydiving FAQ’s today. We understand that skydiving for the first time is a big deal. Chances are, you’ve got skydiving questions you’d like to ask – and chances are, someone else has asked them before, too! Below, you’ll find answers to some of our most frequently asked questions about tandem skydiving as well as our learn to skydive PSP training program. If you have any additional questions about skydiving in North Carolina, please feel free to get in touch or give us a call at (910) 904-0000 and we’ll be happy to help. Can I bring my friends and family to watch? Definitely YES! Friends and family are welcome to tag along during the ground activities and use the seating / viewing area. We also have a restaurant on site, PKs Grill & Pub, so bring everyone! The class is about 10-15 minutes. Prior to the jump, your Instructor will walk you through the training again. I am coming out with a friend(s); can we jump at the same time from the same airplane? Yes. Smaller groups of 2-3 are usually no problem. There are a number of variables and with advance notice, we can accommodate larger groups. For larger groups you will always get to jump with someone from your group, but you may be asked to form smaller sub-groups. As with any sport, the better shape you are in the easier it will be and the more fun you’ll have. However, we’ve taken people with many different disabilities. If you have a special requirement, call us! We can make your dream of flight come true! How long will I be on the dropzone? For weekend reservations allow yourself to spend the entire day. Tandem classes last 10-15 minutes. After the class, the time it takes for you to jump has a few variables such as weather, if we are busy that day, and when you signed in. Ideally a tandem jump can be completed in half a day but be prepared to spend the entire day. Yes. For safety purposes tandem jumpers must weigh less than 230lbs; for the student program the weight limit is 250lbs. No exceptions can be made and weight will be verified. In very rare circumstances it may be unsafe to take a passenger even if under the weight limit if the harness doesn’t fit correctly. Our Instructors make the final determination to keep everyone safe. There is no maximum age but you must be at least 18 years of age regardless of parental consent. There are no exceptions to this rule. A valid photo ID (drivers license, state ID, or passport) is required to sign up for class. If you do not have an ID you will not jump. Visa, MasterCard, Discover, Amex, or Cash (ATM on site). Sorry, NO CHECKS. Although it is unlikely that your main parachute will fail to open properly, it does sometimes occur and this is a common question. According to federal law, every jumper must be equipped with a main and a reserve parachute. In addition, all Skydive Paraclete XP equipment are equipped with an Automated Activation Device (AAD), which will automatically open the reserve parachute should the jumpers be unable to. Up to 60 seconds in freefall and about 5-7 minutes under canopy. The sensation of freefall is more like flying than falling, and is intensely exciting and liberating. The canopy flight is peaceful and relaxing. Can I get a video or photographs of my jump? Yes. We can provide you with videos that have been edited to music and include a pre-jump interview. We also provide high definition digital stills of your skydive. No, it is against USPA safety regulations. Also, you are much too busy with your skydive to look after your cameras. It very easily may get lost or broken and we cannot risk dropping it in freefall or under parachute. I want to get my skydiving license, where do I start? The first thing you need to do is sign up for a First Jump Course (FJC) by calling 910 904 0000. 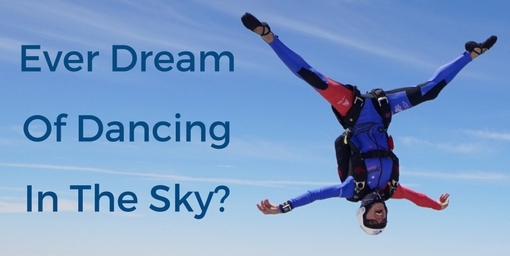 This course covers all theoretical and practical training necessary to prepare you for your first solo skydive. All aspects of your jump including equipment, aircraft procedures, exit procedures, freefall, deployment, canopy control, and dealing with malfunctions should they occur, will be taught. We also incorporate wind tunnel training. To ensure that you get the most out of your first jump and to accelerate your progression we practice basic body flight in our wind tunnel before your first solo skydive. What if I can’t make it to the scheduled class? We strongly recommend making arrangements to attend the regular classes. If this is absolutely not possible we will try to schedule something for you. Call the office at 910 904 0000 or email laurenbyrd@flyxp.com. Where to classes take place? Who may participate in the Paraclete Student Program? You must be at least 18 years old, weigh no more than 235 lbs. and be reasonably fit. You also must be able to provide a government issued photo ID. Do I have to do a tandem before starting the program? No. We do not require that you make a tandem skydive before starting the PSP program although we strongly recommend it. Every tandem jump counts towards your jump total. I’ve been in the tunnel before, do I have to do the tunnel portion of the PSP program? We are glad that you have had the experience of body flight before. However, we will need you to go through our student specific tunnel training. Your training will be with one of our skydiving instructors and you will work on specific skills to prepare you for your first jump. The program consists of 18 jumps. During these jumps all requirements to apply for an A-license will be met (must reach a total of 25) By completing all levels you will be set up for a successful continuation of your skydiving journey. How many jumps can I make in 1 day/week? It depends on many factors like weather, daylight, timing and your personal mental and physical abilities but typically people make anything between 1 to 5 jumps in a day. It can take from a few weeks to a few months, often depending on the weather and your availability. Please be aware that jumps must be made within 30 days of each other to avoid retraining or repeating earlier jumps. Do I get video of my jumps? Yes! Your instructor will wear a camera for all of your jumps to use during debriefs. We will provide a flash drive so you can take your videos home. All videos are included in the price. Athletic clothing and closed toes shoes that allow unrestricted movement is recommended. What kind of gear will I be using? You will be supplied with all the equipment you need for your PSP jumps. Including a parachute, jumpsuit, helmet, goggles, altimeter and log book. The gear we use is the best gear available on the market and maintained very well by our highly experienced rigger. I have my own gear, can I use it? Until you have your A-license you will use the gear from the school. I have a GoPro, can I wear it? No. Besides a few other requirements, skydivers must have at least 200 jumps to wear any kind of camera equipment. We recommend that you show up anyway. The weather can always get better and if you are not here, the chances that you get to jump are nonexistent. Besides, as much as possible we will try to work on ground theory, A-license tests or organize a packing class. What does Skydive Paraclete XP consider bad weather? Conditions that affect the postponement, delay or cancellation of PSP skydives are clouds, rain and wind. How much does it cost to skydive after I get licensed? Once you have your A-license the cost will be $25 per jump. This does not include gear rental. I’ve done a few training jumps at another drop zone or a long time ago. Where would I start in your training program? Previous training will integrate with our program in different ways depending on what your training was and how long ago. Please email our instructor laurenbyrd@flyxp.com to discuss your individual situation. I went to Military Freefall School, what does it take to become a licensed skydiver? You are at the right place! Many of our instructors have experience with military freefall school and are very familiar with your needs. Everything depends on your situation but typically the transition can be done easily. We offer a transition class followed by instructional jumps by one of our USPA certified instructors. Email laurenbyrd@flyxp.com for more information or to schedule a class. I have brought two family members here to jump because I truly trust these people and their skill level. If you want to go anywhere east of Greensboro to jump, THIS IS THE PLACE TO DO IT!! !